In A Desert Encampment, Songs Of A Vanishing Way Of Life Producer Colin Bass worked with the Nigerien group Etran Finatawa to create The Sahara Sessions, an album recorded on location about the struggles of African nomads. The musicians of Etran Finatawa come from the Tuareg and Wodaabe tribes, two nomadic groups who have historically been rivals. In January, English musician and record producer Colin Bass found himself in the midst of an extraordinary assignment. 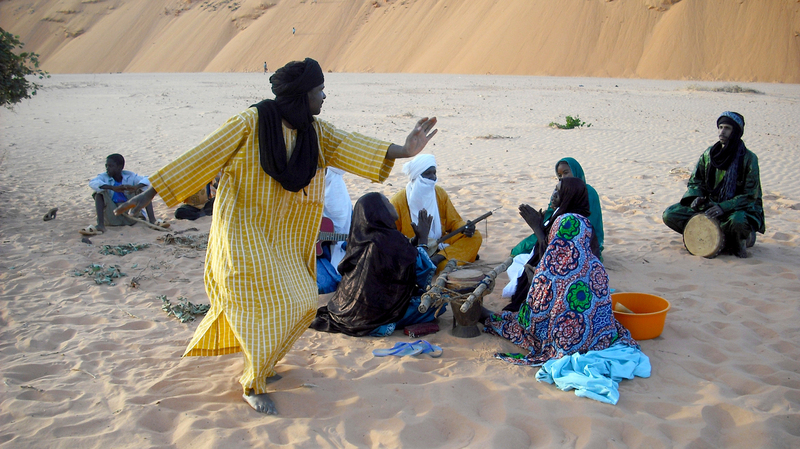 Bass had traveled, with microphones and recording equipment in tow, to the Sahara desert to meet up with a musical group called Etran Finatawa. "They come from Niger, next to Mali, in West Africa," Bass says. "Etran Finatawa is a band that is made up — unusually — of two sets of musicians, who stem from nomadic tribes. On the one side you've got the Tuaregs, and on the other side you've got the Wodaabe. Normally they didn't mix together because they would be rivals in the old days, when they could live their nomadic lifestyle." Bass was there to oversee what would become The Sahara Sessions — an album recorded in a tent under the stars. Its central theme hinges on what all the musicians in Etran Finatawa have in common. "They've come together because the nomadic peoples, as a whole, are actually threatened — their lifestyle is threatened," Bass says. "All the songs are about this disappearing lifestyle. It's a plea for tolerance and it's a plea for the various peoples of the area to come together and live together." Colin Bass spoke with NPR's Linda Wertheimer; click the audio link to hear their conversation.